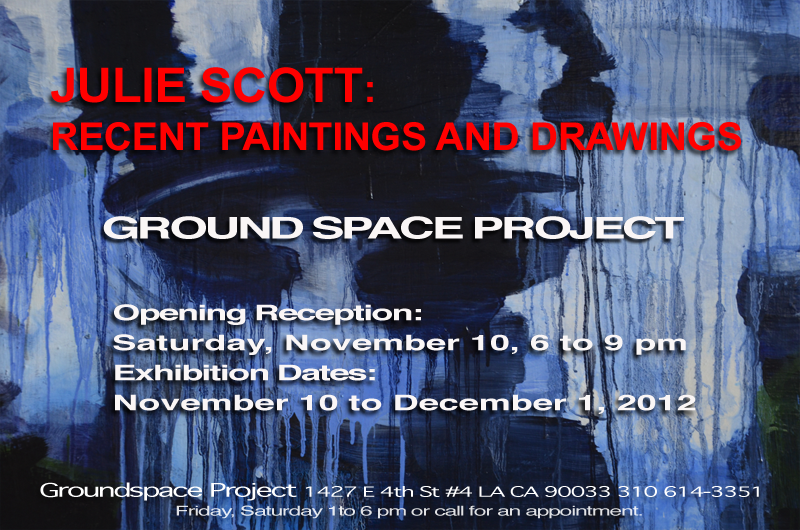 Julie Scott: Recent Paintings and Drawings: Opening Reception: Saturday, December 1, 6 to 9 pm. The exhibit, Julie Scott: Recent Paintings and Drawings, comes from Julie’s love of wandering. Julie Scott’s new works are delicately lyrical yet embody the strong physicality of large gesture and painterly prowess. Setting-up for the viewer sensory discoveries and cognitive jolts, both paintings and drawings present the artist’s converging, and sometimes crashing, experiences of external environment and studio reflection. Groundspace Project is an alternative exhibitions space located in downtown Los Angeles at 1427 E. 4th St., Los Angeles, CA 90033. Gallery hours are Friday and Saturday, 1 to 6 pm or call for an appointment, 310 614-3351.